Live Green, Wear Black. 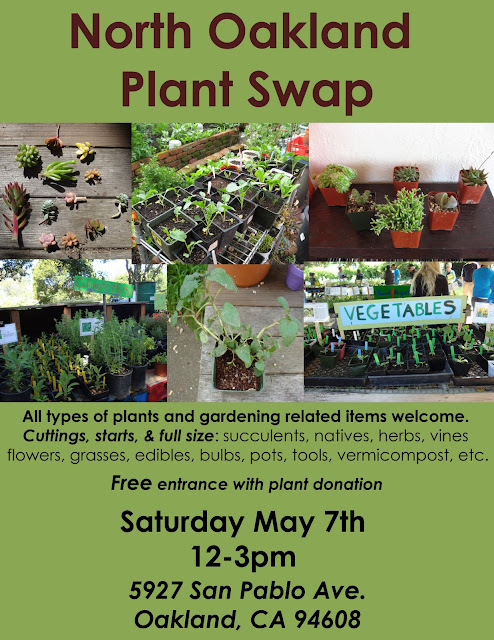 : Plant Sale in Oakland on May 7! Product Review: Nacheez - It Even Fools the Cats! Plant Sale in Oakland on May 7! Spring Plant Swap in the North Oakland Golden Gate Community. Have plants you need to prune? Extras that don't seem to fit in with your home or garden? Started too many seeds this year? Why not bring them all down to the North Oakland Plant Swap and trade them with your neighbors for some new-to-you plants and gardening supplies. At the plant swap you can bring plants, cuttings, seedlings, starts, foraged plants, and seeds of edible & non edible plants. This is also a great place to bring any extra gardening supplies you have: pots, natural fertilizers, vermicompost/worms, garden tools, stepping stones, etc. Pass them all on to a new home and come pick up some new-to-you plants for your garden and home. Need to donate your plants earlier than the swap date? No problem. We will be accepting donations at the swap location May 4th, 5th, & 6th.